First of all.. Let me apologize. HOLY COW. Yes, I am a total amateur photographer.. but these are just pathetic. SERIOUSLY SAD. I need to take some classes or something. My pictures are usually okay when I have reeaalllly good lighting. But if it is overcast, I am doomed. Its madening because my cookies are so much brighter in real life, be it as it may.. here they are! I LOVED doing these (have I used enough CAPS for you yet??). Halloween is my favorite holiday. Tied with Christmas of course. 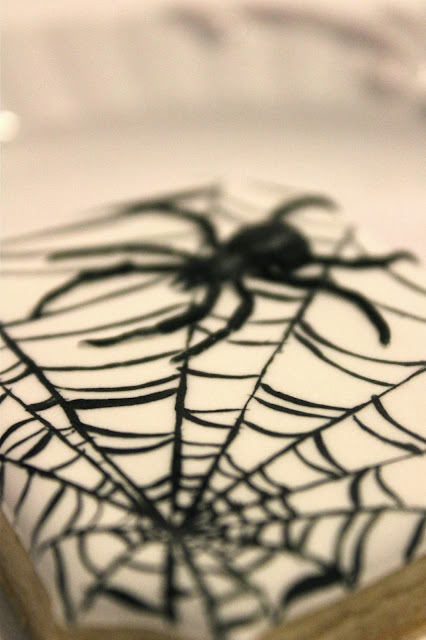 Here is my spidee cookie inspired by the incredibly talented sweet ambs. More cookies coming soon! Enjoy this gorgeous fall weather and wonderful week! Caitlin, out of all the cookies you've done, these are my favorites! I am in love with e spider ones. These are AMAZING! Love these SO much!